The theme of a Scottish or Irish kilt wedding is fast becoming the most popular theme for bridal couples in both Scotland and Ireland It would seem that more and more young (and sometimes not so young) couples want a theme that reflects their Celtic roots, and naturally the kilt delivers a spectacle that is second to none. No bride of course wants herself or her dress to be outshone on her big day, however they do want the world to see what a handsome brute of a man they are about to marry, and the kilt shows him off like no other outfit can. 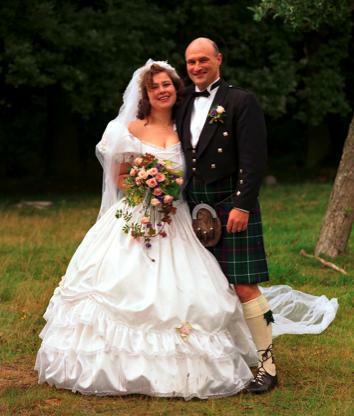 There is nothing quite like the sight of the bridegroom and his best man standing at the alter in their kilts, the groom waiting no doubt a little nervously for his beautiful bride to arrive, and many of the male guests also fitted out in full Highland Dress. On a personal note I was married here in Bavaria Germany, in full Highland Dress, and I can tell you my wife and I had a great number of local residents attending the church service. The reason was that the Sunday before, the minister announced to the congregation that the following Saturday there was to be a spectacle such as the village had never seen before. When the villagers heard that there was to be a kilt wedding with several kilted Scotsmen at the church, they simply had to come and see for themselves. Many had previously only ever seen photos, and this was an occasion not to be missed. 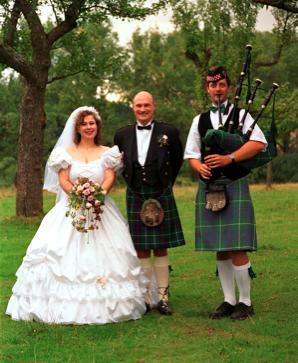 My wife Heike and I were even fortunate enough to retain the services of a wedding piper who played traditional Scottish music both in the church, and later at the reception. He naturally was also dressed in his kilt but no I didn't fly him over from Scotland, he was in fact German and was so fascinated by bagpipe music which he first heard being played on the streets of Nürnberg, that he learned the instrument himself. Which I might add is no mean feat (I tried later that day and could hardly get a note out of them). 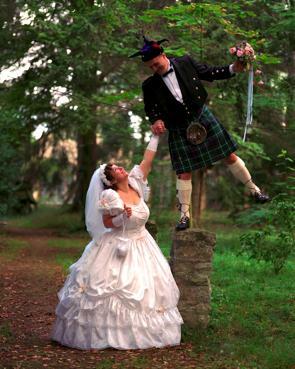 So if you and your fiancee want a theme that sets you apart, whether or not you have Celtic heritage you may want to consider an Irish or Scottish kilt wedding. After all you want to have something to tell the grandchildren while the memory is still fresh in your mind. But what if you don't own a kilt? well you could always rent one, that's what many Bridegrooms and wedding guests do when buying the kilt outfit proves to be to expensive.